Darpa's Orbital Express program resumed its demonstration activities last last week after nearly three weeks on hold. The program is conducting a three-month, on-orbit demonstration of a Next-Generation Satellite (NextSat) and a servicing vehicle known as ASTRO to prove that spacecraft can be refueled and upgraded in space. Program officials have been trying to figure out what caused a critical failure in the ASTRO's flight sensor computer known as AC-2 and the subsequent loss of navigation. The spacecraft had been in the middle of a separation demonstration to 10 meters when the failure occurred, causing the ASTRO to move into an abort trajectory that carried it 120 meters from NextSat. 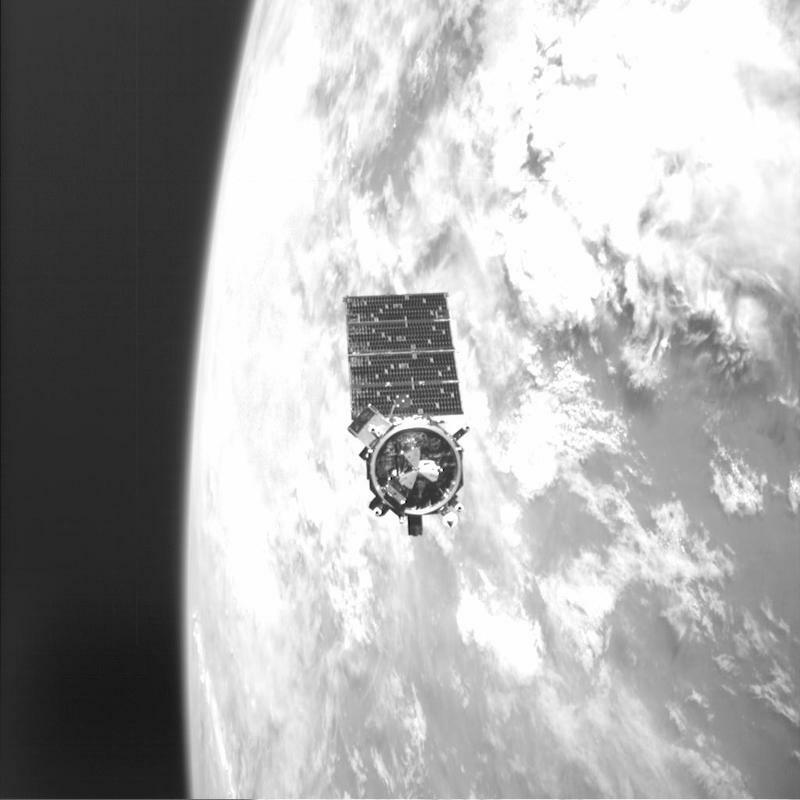 The spacecraft were remated on May 19. 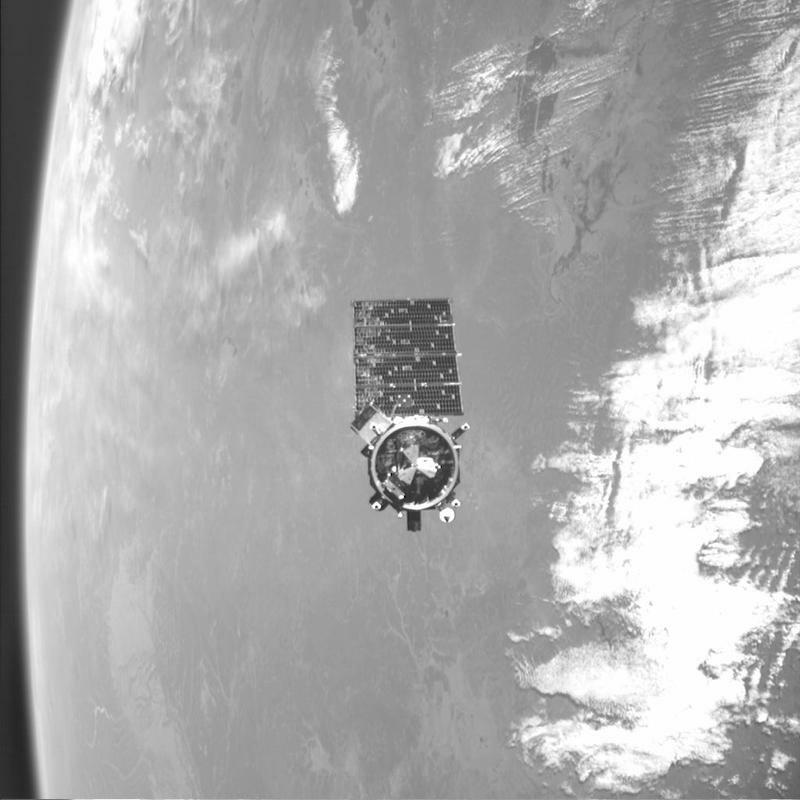 Since remating and resumption of the demonstration, NextSat replaced a battery on ASTRO and ASTRO transferred fuel to NextSat. 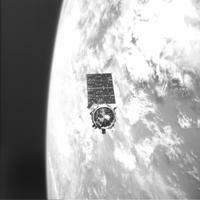 Program officials plan to begin separation activities once questions about the flight computer have been resolved. Did you know that, way back in 1960, Joseph Kittinger jumped from a hot air balloon at the altitude of 102,800 feet (more than 19 miles)? He freefell for 4'36". I've been following the Defense Advanced Research Projects Agency's Orbital Express demonstration program with some interest this week as the demo suffered a setback caused by the failure of a sensor flight computer known as AC-2. Orbital Express is in the middle of a three-month demonstration designed to prove that spacecraft can be refueled and upgraded on orbit. 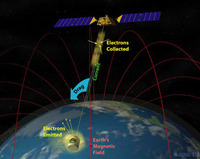 The effort includes a surrogate Next-Generation Satellite, or NextSat, and the service vehicle known as the Autonomous Space Transport Robotic Orbiter, or ASTRO. On Monday, the agency announced that a sensor computer failure had caused the two spacecraft to separate to a distance of 120 meters when they were trying to separate to 10 meters. Program officials have been trying to correct the problem ever since but noted that the spacecraft were under control and safe. Orbital Express Lost in Space? Is the Pentagon's robotic satellite refueler lost in space? 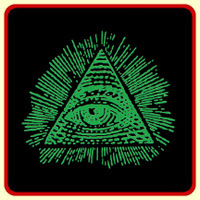 Apparently not, according to the Defense Advanced Research Projects Agency, which says its Autonomous Space Transport Robotic Orbitor and Next Generation Satellite are safe and sound. But the two spacecraft making up the Orbital Express demonstration program suffered a setback that program officials are scrambling to correct after the ASTRO vehicle traveled farther away from the NextSat vehicle than planned last Friday. 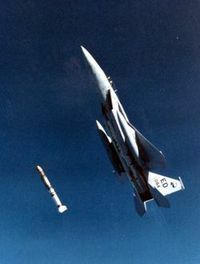 The spacecraft were supposed to separate to a distance of 10 meters and then remate, but a "serious sensor flight computer anomaly" put the ASTRO into an abort trajectory that sent it 120 meters from NextSat. But it's not time to get too gloomy about the program. Just one week earlier, the spacecraft successfully separated to a distance of 7 meters and remated. Darpa is attempting a three month demonstration designed to prove that spacecraft can be refueled and upgraded on orbit, extending their lifecycle and reducing the costs associated with high-risk satellite launches. Northrop Grumman has released photos of successful fluid transfers between the two Orbital Express program spacecraft. The Defense Advanced Research Projects Agency is attempting a three-month demonstration to prove that spacecraft can be autonomously refueled and upgraded on orbit by a service vehicle. Darpa believes enabling autonomous on orbit servicing would reduce the risk and cost of operating in space, enabling easy upgrades as technology improves and reducing launch costs. During the demonstration, a surrogate "Next Generation Satellite," is being serviced by the Autonomous Space Craft and Robotic Orbiter, or ASTRO. Last week, the spacecraft successfully, and mostly autonomously, separated to a distance of 10 meters, flew in formation for an hour and remated. The program objective is for the spacecraft to separate to a distance of 7 kilometers. Darpa says this video moves faster than real time because it's composed of still pictures. 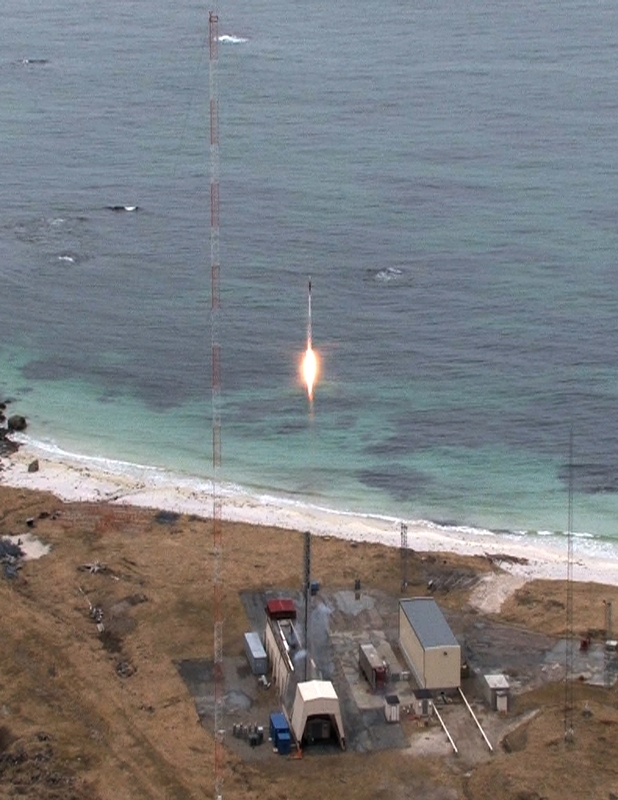 Norway's munitions and missile company Nammo Raufoss successfully launched a 10 meter long hybrid test rocket from Andøya Rocket Range in the Lofoten Islands, northern Norway, last week. The propulsion system of the hybrid rocket was based on solid fuel and liquid oxygen held in separate compartments. Nammo designed the Hybrid Test Rocket (HTR)'s rocket motor, tank and valve system and its mobile Ground Support Equipment (GSE) in cooperation with Lockheed Martin Michoud Operations of New Orleans, Louisiana. Production, testing and launch were the sole responsibility of the Norwegian company. The Andøya Rocket Range facility was responsible for developing and building the telemetry payload and for providing launch services. 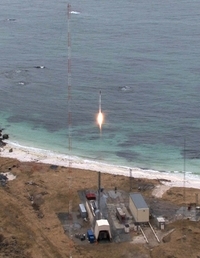 The firing was the first-ever of a liquid oxygen-based rocket from Andøya. The probability of a severely damaging collision with debris over the five- to 10-year lifetime of a medium-size satellite is already approaching 1 percent in the most densely populated regions of space. The Chinese destruction of a 1-ton satellite in January increased this risk by roughly 25 percent. Then, rather than just tracking the problem, Wired magazine details what some of the solutions might be. My favorite one is tethers. Tethers Unlimited, Inc wants to use 'electrodynamic tether drag to deorbit a spacecraft'. 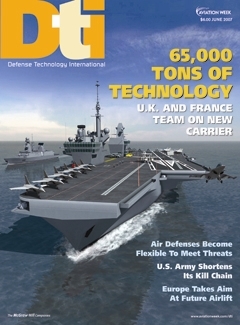 Aviation Week's Craig Covault reports in the latest issue that the National Reconnaissance Office is going commercial in its urgent search for a stopgap optical imaging system. The NRO, Covault reports, is starting a several-hundred-million-dollar procurement for camera-carrying satellites, and the leading contenders to meet the requirements are commercial providers GeoEye and DigitalGlobe. 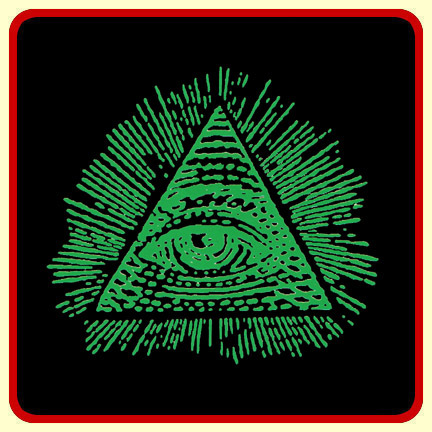 The two US companies already operate satellites that provide unclassified high-resolution images for commercial and government users, including the vivid images that make GoogleEarth so addictive. When China deliberately destroyed one of its own weather satellites in January, it got a lot of people talking and worrying about what it all means. Now, the United States is wondering whether it needs new weapons to disable satellites, according to the Los Angeles Times. The paper reported on Sunday that the U.S. Air Force will begin reviewing the vulnerability of its satellites following orders by Air Force Chief of Staff Gen. T. Michael Moseley. 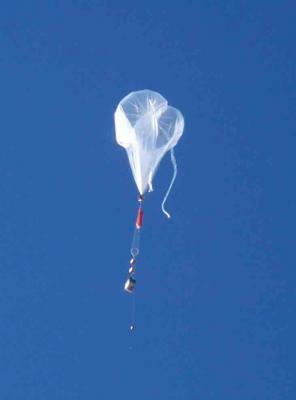 The Times says the review was prompted by China's failure to explain why it demonstrated a satellite kill technology. Just last month, China military expert Michael Pillsbury told a congressional advisory panel that China intends to have an anti-satellite technology by 2020.